Wood River High School junior Macy Mitchell and sophomore McKenna Norris attended The Evergreen Classic Benefit Hunter/Jumper Show Aug. 6-10 in Monroe, Wash. Both competed in U.S. Hunter Jumper Association (USHJA) National Hunter Derby. Mitchell on Kantos earned several high ribbons in the Children’s 1.10m Jumpers and Modified Junior 1.15m Jumpers. She was champion of the Children’s 1.10m division and fourth in the Modified Junior/Adult 1.15m Classic. These results qualified Mitchell and Kantos to compete at September’s $10,000 Children's Regional Jumper Championship at Sacramento, Ca. Mitchell and her mount Ringmaster earned Reserve Champion 3’6 Jr Hunter and second in the Junior/Adult Working Hunter Classic. Norris was Equitation 14-15 Champion aboard Quidam de Rejoice and they ranked fourth in the competitive Pessoa Medal group. 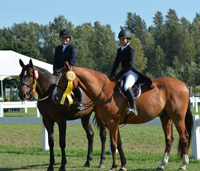 The pair earned third place in Junior/Adult Working Hunter Classic. In addition, Norris and Calendar Girl took home third place in the 1.0m Children's Jumper Classic and some high ribbons in their “Open” classes. At The Valley Club on Thursday, Aug. 14, Kristen O’Reilly aced the sixth hole of the South Nine from 100 yards using a 9-iron. Witness was Suzanne Williams. The Board Bin of Ketchum is sponsoring its 12th Almost Annual Skateboard Contest Saturday, Aug. 23 at Guy Coles Skatepark, Ketchum. That’s located at the corner of Warm Springs and Saddle roads. Registration begins at 10 a.m. and practice runs at 11 a.m. Helmets are required for participants under 18. Entry fee is $15 per person. There will be prizes and t-shirts. Saturday’s contest will include top-notch skateboarders joining those just starting out. The event is a bonus-point stop on the 2014 Wild West Skateboard Contest Series (WWSCS) that features competitions at Jackson Hole, Wyo. July 26 and Sept. 6, and at Driggs Aug. 16. Those competing in Ketchum on Saturday can earn up to 214 points toward the WWSCS championship title for this summer. The Sun Valley Ski Club is inviting the public to a morning hike up the back side of Dollar Mountain on Friday, Aug. 22, followed by no-host breakfast at The Kneadery in Ketchum. The hike is about an hour of easy to moderate terrain. Meet at 8:30 a.m. Friday at the intersection of S. Leadville and Lava St. in Ketchum. For details, contact the ski club 622-3003 or RSVP sunvalskiclub@gmailcom. Jade Mitchell, silver in forms, silver in sparring; Ivan Rodriguez, bronze in forms, gold in sparring; and William Mitchell, bronze in forms.